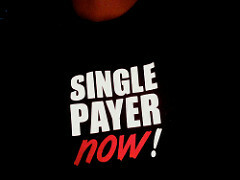 SINGLE PAYER IS COMING—WE’VE OURSELVES TO BLAME | Virginia Right! Promises to repeal and replace the A.C.A ( ObamaCare) is clearly in trouble and whatever emerges from this mess will be a far cry from the solemn pledges Republicans have made for the last 8 years. Stop the presses—politicians lying. It is however a tad disingenuous to put it entirely on the backs of republicans who knew all along they were never going to take away another new entitlement that Congress gave millions back in 2009 when this monstrosity was passed. An honest assessment is in order so that we can begin to prepare ourselves for a Universal National Health Insurance plan, equally important so as to clearly understand why it happened. “ you own a beautiful water front home worth around a million dollars, you have a 40ft Winnebago sitting in the driveway with a 36 ft. Cabin Crusier , several water ski-doo’s, a very healthy balance in your investment portfolio—–and you think someone else should pay for your prescriptions “ ? Obviously I haven’t been invited back since 2003. Prior to the approval of the A.C.A the poor were already eligible/covered by Medicaid. It was the expansion of Medicaid after A.C.A’s passage that brought in ( among the states that took the Fed’s dough & expanded their Medicaid programs ) millions of able bodied Americans who once again demonstrated that they believed they were entitled to medical coverage , and equally important their fellow citizens should subsidize the costs. You can begin to see the “ entitlement mentality” here in play. Republican Governors across the nation including Ohio’s John Kasich took the federal money , expanded his state’s Medicaid coverage and now is insisting the slow down in the growth rate of Medicaid ( which is what the Senate proposal does, it does not cut the program ) is unacceptable. Some might say Kasich is just doing what politicians do ,he is afterall a career Pol. Republicans never intended to take away a new federal entitlement no matter what they pledged. The bargaining going on in DC, let’s call it what it is BRIBES, with 40 billion more for opioid addiction treatment, another 75 billion in insurance company subsidies ( to stabilize the exchanges) is just such evidence of how impossible it is to do what is right in the long term for the nation, which is to repeal this legislation all together and craft free market based solutions that are there, if only politicians would stand up for a principle. That isn’t going to happen and we will stumble along with some political patchwork that won’t fix anything until a future Congressional majority caves and installs universal care. I write however to bring as the late Jerry Lund used to say, some intellectual honesty, into the discussion. Saul Alinsky stated decades ago “you must co-opt more of the white middle class in order to collapse the system and bring about the change”. I hope Jerry is playing on Heavens golf courses, I do know for certain Saul is quite satisfied these days that the co-opting he spoke of is almost complete. ← YES, Cliff Hyra Should Be Invited to the Virginia Bar Association Debate! Thank you for reminding Republican voters it was George “Dubya” Bush who gave America Medicare Part D UNFUNDED that drove up prescription drug costs for middle class senior citizens. And as a reminder for the Republican voters it was Dr. William Frist, Senate Majority Leader R-TN, who moved that bill through the Senate for passage- a Republican gift to Big Pharma. Frist, for those who don’t know, is the heir to America’s first For Profit Healthcare system- Hospital Corporation of America -HCA. and Ed Gillespie, Virginia’s Republican nominee for Governor in November, brags he was George W. Bush’s advisor. The stark reality of a national healthcare system is the creation of doctor shortages. The fact is America does not have enough physicians to care for everyone in a single payer system. This is the fallacy of the ” healthcare is a right” campaign by the LEFT – the Big Democratic Lie. For decades, American taxpayers have trained foreign students in America’s top medical schools and residency programs only to send them back home to their countries of origin creating shortages in our own American system. America will have to import many foreign medical graduates ( FMGs) many from third world countries and YOU DO NOT WANT a graduate of the University of the Punjab operating on you in an emergency . Trust me. Medicare Patients ( the SENIORS) and Medicaid Patients ( the POOR) will be relegated to nurse practitioners and physician assistants for their healthcare. And the Sheeple will die due to long waits. This is not a criticism of those primary care givers. It just highlights the fact they never spent a day in medical school or a 3-5 year residency and are not DOCTORS who should be treating seriously ill patients with complicated medical diagnoses often seen in the elderly population. The Rich of course will always have access to private healthcare. Many Good Doctors- the ones you want to see- have already converted their practices to concierge medicine just ahead of Single Payer where patients now pay them thousands of dollars a year for ON DEMAND ACCESS. There will be a two tiered system. The wealthy elites and political ruling class will always have private healthcare. Brought to you by the Republican Party. YOU won’t see your Congressman and Senators in the DMV like lines at the health clinics for the Sheeple. Ted Cruz saw to that. This is happening in Richmond. Our physician in a multi- doctor practice at St. Mary’s Hospital went Concierge in 2009-2010. He sent 1200 patients a letter requesting $1500 a year to be on call 24 hours a day and the promise of getting in to see him quickly and those of us who couldn’t afford it were relegated to his nurse practitioner whenever we called to make an appointment and you know what that FAT CAT did after 2 years raking in millions for his concierge racket? He retired and threw his thousands of patients to the wind so he could work for St. Mary’s on a salary. Most of those doctors in that practice went Concierge and formed a new practice leaving us with no doctor. Many offices don’t accept new Medicare Patients because it pays so poorly and pays months behind. Now we often just go to some Urgent care when we are sick and are not getting decent healthcare with a doc in the box. Like you said- they are from a foreign country and barely speak English. Charles Krauthammer stated this on the 6:00 pm Fox News Channel with Bret Baier several weeks ago. Said the US would be single payer within two years if memory serves me correctly. This from the Doctor who knows all in Washington. We cannot afford single payer without competition or some type of price controls. The crooked bastards who run healthcare would bankrupt the entire USA. Also, its $45 BILLION for the addict junkies, not just a mere $40 Billion. Not keeping up with inflation is in fact cutting Medicaid, or anything else for that matter. Isn’t what’s going on right now in the Senate is McConnell creating massive, never ending payouts in the billions, or possibly even eventual trillions to those states that expanded Medicaid? This so they will vote yes to Trumpcare, and exchange their Medicaid expansion billions for even more money. Virginia, well, we get/got ZERO because of the Republican Party base. ZERO. Thanks, Tommy Norment and Speaker Howell. Over $10 Billion lost in Virginia, and still counting. I believe that Trumpcare has to pass so Republicans can say to their low IQ Trump/Limbaugh base that they repealed Obamacare. Even though they basically somewhat just renamed it, made it worse, cut Medicaid that Trump said he wouldn’t touch, government subsidized it even more, and turned it into another Trump lie. It simply has to pass because Republicans have their backs up against the wall. Is McConnell buying off Senators one at a time for billions of dollars each for their states so they will give up Medicaid expansion? Doing exactly what he accused Democrats of doing to pass Obamacare. Let’s see how big a payout McConnell and Paul get for their Kentucky. Kentucky took Medicaid expansion. You can bet it will be well hidden. Disclaimer: I am not a Democrat. All the evidence one needs to see the flaws in socialized medicine is to visit any country that has it. In some provinces in Western Canada one must enter a lottery system to get common procedures done, or wait often 6 or more months for a hip or knee replacement. Gene is correct in his statement of the corruption. The repeal effort failed for one primary reason and one secondary reason. The primary reason as Gene correctly states is the bribing of elected officials by both the big drug companies and hospitals, insurance industry. They are addicted to the flow of government dollars and won’t give that up. The secondary reason is the republican cowardice with their fear of the media pounding the message of the folks who will be ” thrown off the rolls” of Medicaid. Personally I have no problem kicking off some 30 year old living in his parents basement and won’t find a job, an apt description of many who were now insured when Medicaid was expanded. Republicans will not fight for a principle, they covet their seat so desperately they will do anything to retain it. That is not leadership. HERE is the road map to Single Payer. Thanks to the Republican Party led by Mitch McConnell. There is plenty of blame for Republican Senate Majority leader Mitch McConnell. Trump in some Quid Pro Quo deal with McConnell appointed Elaine Chao, Chinese Communist wife of Mitch McConnell, as Transportation Secretary in a deal to get Trump’s agenda through the Senate. Now that McConnell has failed it’s time for Trump to purge the Chi Comm daughter of a drug smuggler from the F*ing Cabinet. Talk about Enemies Within. Where is Tom’s favorite Kiwi? Trevor Loudon? Mitch McConnell is as Corrupt as they come: dirty money from drug smuggling in laws. I refuse to be blamed for what the traitors in DC do. They REFUSE to listen to the people…we vote them out and they are replaced with more of the same. What can we do that does not involve an overthrow of the current system?